As we age, the skin in our eye area loses elasticity and excess skin forms. Fatty tissue can also accumulate under the skin. Your eyes will slowly “look older” because the aging process leaves the eyes tired and wrinkled. Even with a good eye care regimen, wrinkles and drooping eyelids will eventually catch up to you. Genetic factors can also cause these aging effects in quite young people. An Eye lift can restore a youthful and refreshed appearance to your eyes, and will open up the eyes by correcting drooping upper lids and removal of puffy bags under the eyes will complete the new restored look. Eyelifts (blepharoplasty) are a very popular procedure for Asian eyes, as it can significantly change the appearance of the eyes by opening them up to appear brighter and larger.Before surgery, the surgeon marks the incision sites, following the natural lines and creases of the upper and lower eyelids. Underlying fat, along with excess skin and muscle, will be removed during the operation. 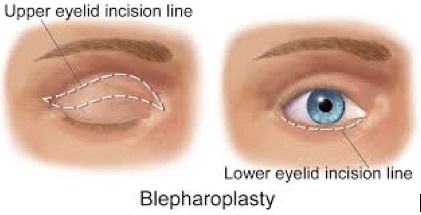 In a transconjunctival blepharoplasty (lower eyelid bag removal), a small incision is made inside the lower eyelid and fat is removed with fine forceps. No skin is removed, and the incision is closed with usually with dissolving sutures. Both men and women have eye lifts, with the best candidates being those whose eyes are droopy and baggy, but this can differ from person to person. Both older and young patients can benefit from this procedure.The best candidates for blepharoplasty are always physically healthy and emotionally stable. It is also best if you are well-informed about the procedure. Ideal candidates are typically at least 35.Candidates may be excluded if they suffer from any of the following conditions: dry eye, high blood pressure, hypothyroidism, cardiovascular disease, diabetes, glaucoma, or Graves’ disease. Personal anatomy issues, including bone and supporting structure, may also affect your whether you are suitable for this procedure. Before you undergo an eye lift, it is important for you to discuss any medical conditions that you have with your surgeon. You will need to tell him/her about any medications that you are taking including any herbal or any other non-prescription medication. If your surgeon decides that you can have an eye lift, discuss the procedure thoroughly with him or her before deciding if you want to go through with the procedure. You may still change your mind even after discussing the procedure during your consultation.During your consultation your surgeon will also detail the procedure, benefits and risks and answer any questions you have. The assessment with the surgeon will give you a detailed understanding of the treatment – the extent of surgery, your health evaluation, your expectations and exactly where the areas of the eyes will be treated.Your surgeon should be able to answer any questions that you have about eye lifts including questions about what to expect during and after an eye lift and the complications or problems that sometimes occur with eye lifts.At your consultation you and your surgeon will discuss your goals, and last queries you have and finalize the plan for surgery. From your examination, he can determine the best procedure to use, and then explain it to you in detail, including the benefits and limitations. The surgeon may also recommend a combination of the upper and lower eyelid blepharoplasty or submental liposuction, for a better facial profile.It is important to stress the importance of not smoking before an eye lift procedure. Smoking can cause problems with circulation and make complications more likely, including post-operative chest procedures. Please also note the GG Guarantee is not valid for smokers. Incisions are made along the line creases of the upper eyelid and possibly along the outer lower rim of the eye’s skin. When removing fatty tissue, but not skin, the surgeon may perform a transconjunctival blepharoplasty with an incision inside the lower rim of the eye’s skin – he will do this for eye bags and excess fatty tissue removal if necessary. These incisions often reach the outer corners of the eyes. The surgeon then divides the fatty tissue and muscle from the skin so that excess skin, fat, or muscle can be removed. The procedure leaves no visible scars as it is hidden within the natural creases of the upper eyelid and for the lower eyelid, it is completely hidden.The blepharoplasty procedure is often performed under local anesthesia—while you are sedated (twilight sedation) — as a day case. General anesthesia (while you are asleep) may be used. Be sure to discuss the appropriate type of anesthesia with your doctor and the anesthesiologist. Patients return home typically within hours of the surgery. Stitches are removed about 6 days after surgery (if dissolving sutures are not used). Bruising and swelling will continue to subside after stitches are removed. Sunglasses and a protective sun block are required for several weeks. Normal activities can be resumed after about ten days. Strenuous activities such as lifting, bending, or exercise can be resumed after about three weeks.We provide excellent post-care support, with follow-up visits and programs to assist your recovery. If you have any questions or concerns, please let us know and we will schedule an appointment with the surgeon. View our recommendations for post-operative recovery. Many people who travel to Tijuana surgery center have more than one procedure because of the cost advantages and also for a more balanced look.An eye lift will not remove crow’s feet or other wrinkles nor eliminate dark circles under your eyes, or lift sagging eyebrows. Other complementary procedures, including a facelift or a brow lift/forehead lift will minimize wrinkles, and non-surgical treatments such as dermabrasion and Botox will further brighten the appearance and improve skin quality. Please view our non-invasive facial rejuvenation treatments.Gorgeous Getaways offer great packages for combined procedures. Contact us today for more information and a price. Eyelid surgery will ‘turn back the clock’ by opening your eyes, and make you look more youthful and energetic. Following surgery, patients may experience tearing, itchy, burning eyes, dry eyes, light sensitivity, and blurred or double vision, which can persist for several days. These complications can be relieved with lubricating eye drops. There will also be some swelling around the eyes. Scarring is another possible complication. Sometimes patients will have difficulty closing their eyes when asleep: although very uncommon, this complication can be permanent. The lower lids may appear to be pulled down: this rare condition, called ectropion, may require additional surgery. There also may be some asymmetry to the eyes.We minimize risks and complications by selecting patients carefully and always having the most skilled surgeons, physicians and nurses carry out procedures. However, despite the highest standards, complications can occur. They are rare, and most patients will not have complications, but if you have concerns about possible complications, please discuss these with your doctor.